From the bestselling author of Gratitude and Musicophilia, a collection of essays that displays Oliver Sacks's passionate engagement with the most compelling ideas of human endeavor: evolution, creativity, memory, time, consciousness, and experience. Oliver Sacks, scientist and storyteller, is beloved by readers for the extraordinary neurological case histories (Awakenings, An Anthropologist on Mars) in which he explored many now-familiar disorders--autism, Tourette syndrome, face blindness. He was also a memoirist who wrote with honesty and humor about the remarkable experiences that shaped him (Uncle Tungsten, On the Move, Gratitude). In the pieces that comprise The River of Consciousness (many first published in The New York Review of Books, among other places), Dr. Sacks takes on evolution, botany, chemistry, medicine, neuroscience, and the arts, and calls upon his great scientific and creative heroes--above all, Darwin, Freud, and William James. For Sacks, these thinkers were constant companions from an early age. The questions they explored--the meaning of evolution, the roots of creativity, and the nature of consciousness--lie at the heart of science and of this book. 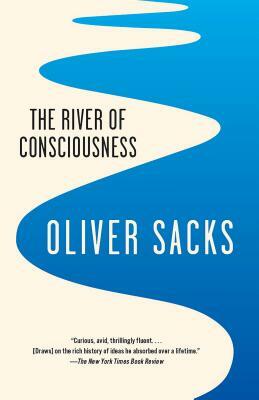 The River of Consciousness demonstrates Sacks's unparalleled ability to make unexpected connections, his sheer joy in knowledge, and his unceasing, timeless endeavor to understand what makes us human. Oliver Sacks was a physician, writer, and professor of neurology. Born in London in 1933, he moved to New York City in 1965, where he launched his medical career and began writing case studies of his patients. Called the "poet laureate of medicine" by The New York Times, Sacks is the author of more than a dozen books, including The Man Who Mistook His Wife for a Hat, Musicophilia, Awakenings (which inspired an Oscar-nominated film and a play by Harold Pinter), On the Move, and Gratitude. He was the recipient of many awards and honorary degrees and was made a Commander of the British Empire in 2008 for services to medicine. He died in 2015.